Mio and Caspian cuddling and relaxing together. 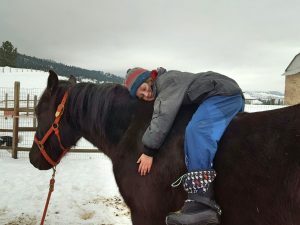 There were lots of times, when I was thinking about how I would survive that while I never had any doubts that my boys would survive it just fine. 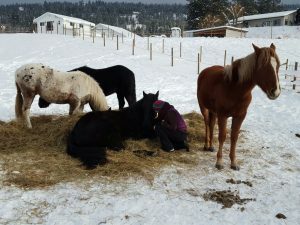 Annika enjoying some herd-time with her four boys. 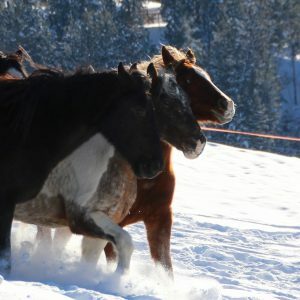 Apart from hacking horse poop out of frozen ground, dragging wheelbarrows through knee-high snow, shoving snow off my shelter roof to keep it from making everything wet and soggy and other not too delightful chores, it actually hasn’t been that bad! 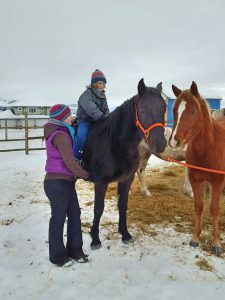 Having two volunteers around to help with the chores certainly helps, but it has also been fun to try out all the different ways we can keep the horses mentally and physically busy while giving them enough peace and quiet to keep their energy levels up. Our first trials to put some live weight on their backs – obviously not too shocking! And apart from the fun, it has been another great learning opportunity. 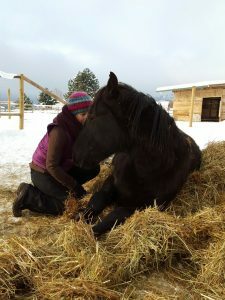 I learnt more about the natural ways horses keep themselves warm, about how to enable them to manage that well, about how different winter must feel like to former wilds in comparison to barn-raised horses, about all the things horses and people can still do outside even when it is bitterly cold and snowy. Not that I have been an indoor wuss up until now, but this has been a new challenge for my creativity. 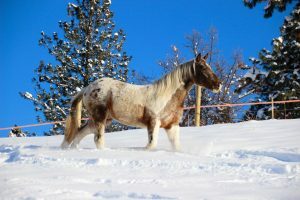 Enough talk, here are some pictures telling about our winter adventures! 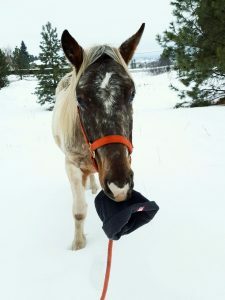 One of my volunteers had the greatest experience with one of my horses today: When she took Dobby out for a little excursion in the neighboring field, they were both happily stomping through the snow when Jamie was suddenly stopped in her tracks by Dobby who pulled her back on the lead line. When she turned around, this is the picture she was met with! Her tuque must have unnoticed fallen out of her pocket and Dobby behind her had seen it, stopped and picked it up! Unbelievable – what a character!!! 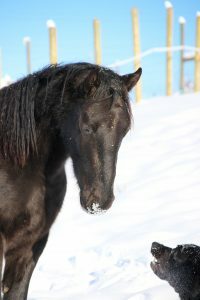 Dobby in beautiful winter sun. 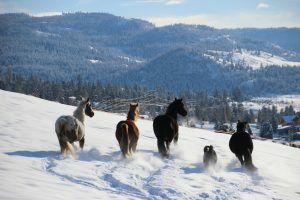 While the four are mostly preserving their energy in the cold, there are some definite playtimes where they simply enjoying being young and rowdy! I would call that a head-to-head race! Our giant dog Bruno doing a good job integrating himself in the herd!